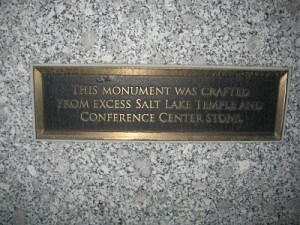 One of the other things we did when in SLC over the weekend was to visit Salt Lake CIty Cemetery after church on Sunday. 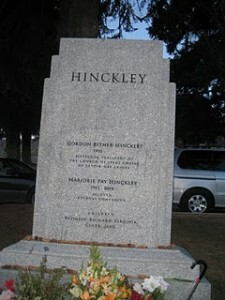 I wanted Tracy’s family and especially the grandchildren to see President Hinckley’s grave and head stone. Notice in this picture the trademark cane along side the beautiful flowers. How totally and touchingly appropriate! We also saw President McKay’s and the area reserved for the family of Hyrum Smith. The words on the stone were so touching. You must go and make a day of traipsing through the sacred grounds and touching history for yourself. President Grant, President Joseph F. Smith and Joseph Fielding Smith were also there. I couldn’t help but imagine the huge family reunion that will be going on in the near future when all these souls are united. We had a picnic out of the cooler: chicken salad sandwiches, grapes, apples, carrot sticks and turkey and cheese sandwiches. Note: no junk food allowed! It was truly the perfect ending to a fun and wonderful family mini-vacation!